A letter to Mrs. Heath thanking her for her donation and telling her of the strong need of education for the young people of Rome and their desire to be in school, and how their donations allow children to once again attend school. 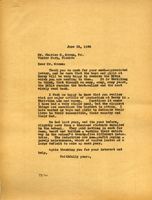 The author informs Mr. Ham that while they appreciate his interest, the Berry school cannot make and sell an article that he requested because they only have a small weaving room and a few looms. The author apologizes and wishes Mr. Ham the best of luck with his project. 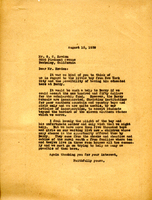 Martha Berry writes to both men about the possibility of Dr. Graves visiting Berry. She says that it would be an inspiration to her students to hear him speak. Martha Berry sends out multiple copies of this letter to various donors hoping for scholarship money for students during a struggling financial year. 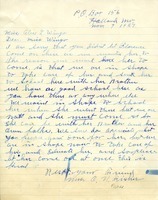 A donation-enclosed reply to plea for a scholarship towards the Berry school for two girls named Claire and Mattie. Claire is an orphan with no home during the summer. Mattie is a 17 year old girl who has nobody to help her. Her sister had to make her own way for five years and doesn't want Mattie going through the same hardship. The author of the plea wants to keep Mattie at the Martha Berry school until she can become more educated and therefore independent. Helen Kittridge donates $150 towards the cause. 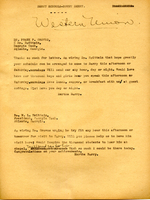 A letter asking for the generosity of friends in sponsoring a child to attend Berry, as there is a long waiting list of children hoping for a spot as a scholarship student at The Berry Schools. She requests $150 in order to fully support a student for a year. Mr. F.A. Sherwood made a donation of $150. Alice B. Warden from Martha Berry thanking her for her donation to the dormitory. Miss Berry informs her that the donations form the teachers and boys and girls will mean the most. She thanks her again and expresses her appreciation. Berry is emphatic that students must not discuss personal matters with visitors. Because of the need to "be very careful of what we say to our visitors," students found to be doing so must be expelled. 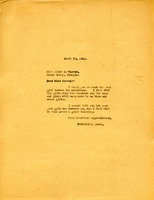 Typed on the reverse of Berry Schools letterhead. 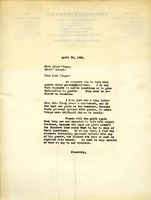 This letter is from George Tyson to Martha Berry regarding a check. 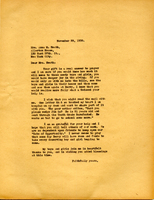 The letter discusses a potential student named Eugene, likely Eugene Gunby.